Rootconf is one of the India’s largest gathering of DevOps, Sysadmins, systems engineers and Site Reliability Engineers (SRE). The main conference is on 11th – 12h May’17 and there are workshops on 13th and 14th May’17. Earlier in 2014 I gave workshop on Docker which was attended was ~40 participants and a flash talk on OpenStack Rally in 2015. This year I would be giving a Kubernetes 101 workshop on 14th. We also be doing a lucky draw both days on the conference and winners would get free access to our online courses. So if you are coming to the conference then don’t forget to come our booth to checkout our offerings and to win the lucky draw. 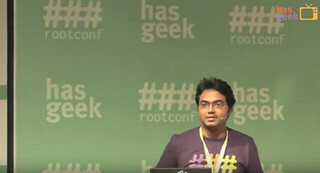 The agenda of Rootconf looks very promising and HasGeek has offered 10% discount to CloudYuga’s friends. So if you still have’t got the ticket then use this link to get it with discount. CloudYuga would also be giving 20% discount on our online courses till 14th May, as long as ROOTCONF code is used while purchasing the courses. This would be our first kind to experience to stand behind the booth for CloudYuga. I am very excited and looking forward to it :).